This post covers how to take a tour of Buckingham Palace, what you will see, and how to make the most of your visit. Be sure to also read our post on things to do in London. This is one of the most historic sites in all of London, and there’s plenty to see and do while you’re visiting. Due to its popularity, we recommend planning your trip well in advance. In this section, we will discuss some of the best times to visit, how to get a ticket, where you’ll find the landmark, security information and other important details you will need to know before taking a tour. Visitors can reach Buckingham palace from several Underground stations, bus routes, and other means. The closest Underground stations are Green Park, Hyde Park Corner, and Victoria. Bus numbers 11, 211, C1 and C10 make stops on Buckingham Palace Road. Click here to get directions for your choice of transportation from anywhere in London. If you need help figuring out which tube to take, make sure to read our posts covering the London Underground and which tube pass you should buy. If you are considering purchasing a hop-on-hop-off ticket while in London, then keep in mind that all companies offer a stop at the palace. Buckingham Palace is located in the City of Westminster which is a separate jurisdictional area from the City of London located in the center of London. The Palace has its own royal gardens on the west side of the building. Two large and lovely parks, St. James Park on the east and Green Park on the north side are both worth taking a stroll in. Depending on when you choose to visit Buckingham Palace, your access to certain areas may be limited. However, it’s important to remember that areas such as the Queen’s Gallery and the Royal Mews are open to the public throughout most of the year. Weather permitting, visitors can also check out the Changing of the Guards, but there is so much to see nearby the palace. The Queen’s Gallery is an incredible collection of artwork and antiques from throughout the history of England. Their exhibits change from time to time, giving guests the opportunity to see new and interesting things with each visit. You can expect to spend around 1 ½ – 2 hours seeing everything on display at this gallery. Admission includes a free audio tour to help visitors explore the area. Although the Royal Mews are closed during the winter, you can come and see them pretty much any other time of the year. This location handles all of the road travel arrangements for the Royal Family. In addition to other vehicles, this is where you will find the carriages used for special occasions. Expect to spend at least 60 minutes exploring the area and seeing all of the displays. During the summer months, you can also visit the State Rooms in Buckingham Palace. These are public rooms which are used to entertain important guests from around the world. Although photography is not allowed, they do provide an audio tour to make your experience much more enjoyable. A visit to the palace and State Rooms will take about 2 – 2 ½ hours to see. NOTE: From late July through September there is a combination ticket that includes the Queens Gallery, the Royal Mews, and the State Rooms. The Changing of the Guards takes place daily in the summer, but only every other day during the rest of the year. If you want to see this event, plan on spending anywhere from 60-90 minutes waiting and watching the ceremony. If you need more details, make sure to read our post about the Changing of the Guards for an in-depth look at the attraction. If you want to know more about each of these attractions, check out our sections below detailing each individual location. Buckingham Palace and all of its attractions have very strict security checkpoints. The following items are not allowed on the premises, but they can be checked into a cloakroom and picked up later. You should avoid bringing any of the following items as they will not be allowed and cannot be checked into the cloakroom. In addition to these items, food and drink are provided at certain attractions such as the Garden Cafe. Baby carriers/hip-carriers are available upon request. Although personal photos are allowed in locations such as the Garden, you are prohibited from taking any kind of pictures in the State Rooms. For more security details, make sure to visit the respective sections for each attraction. Get the most out of your trip by keeping the following information in mind. Tickets to Buckingham Palace and its attractions are all timed. Although the duration of your stay is not limited, you will need to purchase tickets for a specific time of day. There are gift shops at Buckingham Palace which sell souvenirs and water. You will also find a cafe in the Garden if you become famished during your stay. There are also other restaurants near the palace if you don’t feel like eating during your visit. Family activity bags are available free of charge, so be sure to ask for one when picking up your tickets. At the State Rooms, there is a drawing and coloring room. Baby carriers are available upon request. Read our tips on visiting London with kids. Enjoy free re-admission for a year by asking a member of the staff to validate your ticket(s). This allows re-entry for up to a year, so if you need to break up your visit at separate times, you can do so. You will be doing a lot of walking while at Buckingham Palace. As such, we highly recommend wearing comfortable shoes during your visit. This is also a good idea if you plan to take one of our walking tours in the area. Read our tour options below for more information. The Queen’s Gallery exhibits selected pieces of art from the Royal Collection. The collection is quite extensive. It comprises over one million objects, including 7,000 paintings, 30,000 watercolors and drawings, and about 500,000 prints, as well as photographs, tapestries, furniture, ceramics, books, sculptures, and last but not least the Crown Jewels. This photo of The Queen’s Gallery is courtesy of TripAdvisor. Plus occasional weekends throughout the winter months. More information or to book a ticket. TIP: A Queens Galley is included free with the London Pass and the London City Pass. The Queen’s Gallery has rotating exhibits centered on themes or particular artists. To see what the current exhibits are, check their website. An audio-guide is included in the cost of your ticket. The commentary is excellent and you also have an option to listen to music selected for its suitability to the setting. If you are an art-aficionado, check out the official The Royal Collection podcast, which features news of current and forthcoming exhibitions and interviews. If you want to avoid crowds at the Queen’s Gallery, consider making your trip sometime during the middle of the week. These days are far less busy and you’ll have a much easier time seeing the various exhibits on display. Additionally, you’ll also want to consider arriving either early in the day or later in the afternoon. The crowds begin to dissipate at about 4 pm, and you should have more than enough time to explore the gallery if you arrive at least 2 hours before closing. The majority of reviews on TripAdvisor and Get Your Guide are positive and the Queen’s Gallery is rated at 4 out of 5 stars. Read the reviews. Some say, however, that the Gallery’s limited size and a small number of items on display at any given time (about 450) just aren’t enough. 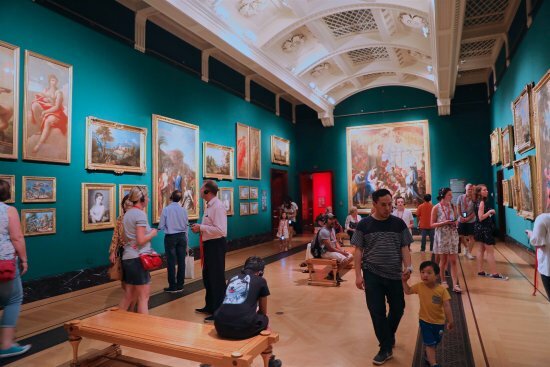 If you have limited time in London or are on a budget, you may also want to consider a visit the free National Gallery which houses a very large collection. It’s one of the dozens of free museums in London. Read our post on Itineraries for Museum Lovers for more great galleries and exhibitions in London. When you book your tickets you must select a time that you will begin your tour. Entry intervals are every 15 minutes throughout the day. You can spend as much time in the Gallery as you want. Set aside additional time to pass through the airport-style security check. Large bags and backpacks must be checked at the cloakroom. Read our security section for more information on prohibited items. The gift shop has exclusive items inspired by works of art in the Royal Collection. The shop has housewares, china, clothing, jewelry, children’s toys, books, and postcards. Proceeds of all purchases go to the care and upkeep of the Royal Collection. The Royal Mews is a group of working stables, housing the Royal Family’s horses and carriages. On display in the Mews is an array of beautiful state coaches and carriages, some of which are still actively used by the Royal Family on special occasions. TIP: A Royal Mews tour is including for free with the London Pass. A highlight is the magnificent Gold State Coach built for George III in 1762. It is so heavy it takes eight horses to pull it. The Gold State Coach has been the carriage of choice for every coronation since 1821. If horses and carriages don’t do much for you, maybe the collection of Rolls Royce limousines, Bentleys and Jaguars will get your motor running! A visit to the Royal Mews includes a free 45-minute audio tour, though you may spend more time in the Mews if you would like. As with the Queen’s Gallery, you’ll also want to consider either an early or a late trip to the Royal Mews. This location gets pretty popular between 12 pm – 2 pm, so we recommend planning your visit for either morning or mid-afternoon. If you plan on seeing both of these attractions, consider heading to the Royal Mews at 3 pm and going to the Queen’s Gallery afterward at 4 pm. Between April and October, guided tours are offered throughout the day. The Royal Mews is an active stable, not merely an exhibit. Security is quite strict – expect an “airport-style” screening. There is no cloakroom at the Mews. For more information on prohibited items, read our security section. Food and drinks are not permitted. There is no food or drink available for purchase in the Mews though you can purchase water at the Mews gift shop. Bathrooms are available only at the end of the tour. From July 21st – September 30th, Queen Elizabeth II goes on holiday which means that the State Rooms of Buckingham Palace open their doors to the public! Since this opportunity is available for only 8-10 weeks out of the entire year, be sure to plan a visit if you are in London during the late summer. There are tours of just the State Rooms and tours that combine the States Room visit with another part of the Palace Grounds. There is also a combination ticket that includes the Queens Gallery, the Royal Mews, and the State Rooms. We have listed these tour option below. There are nineteen State Rooms in all. Among them are the stunning White Drawing Room, the Music Room, the Picture Gallery and world-famous Throne Room, where all official wedding and coronation photos are taken. There are dozens of fine art and objects on display including paintings by Van Dyck and Canaletto, sculptures, period furniture, and rare porcelain. The State Rooms also include rotating exhibitions. For 2018, the palace will be adorned with over 100 different pieces of art personally chosen by the Prince of Wales in honor of his 70th birthday. This tour ticket includes an excellent 1-hour multimedia guide that provides commentary on each of the 19 State Rooms. Though the audio tour is only one hour, you can move at your own pace. You will find guides in each room who can answer questions and who may point out interesting features that are not mentioned on the audio tour, such as the Queen’s secret passageway/entrance behind a mirror. (See video below). You’ll also have the opportunity to stroll through the garden at Buckingham Palace at the end of your tour. We recommend that you give yourself 2 – 2 ½ hours to make the most of your ticket. Admission *Entry is “timed” meaning you must select a time. Start time frequency is every 15 minutes. TIP: The best time to take this tour is early in the day to avoid crowds in later hours. Also, if you want to see the Changing of the Guards while still avoiding the crowds at the State Rooms, consider doing so on a different day than your tour. This is because the Changing of the Guards will take up your morning, thus you would have to take an afternoon State Room tour which is typically more crowded. See our post on how to watch the Changing of the Guards. This combined ticket gives you the opportunity to take a tour of the largest private garden in London after taking a stroll through the State Rooms. You will be taken through select sections of the garden by an expert guide. The tour includes the 3-acre lake, the Rose Garden, the enormous Waterloo Vase and the Palace tennis court. You will be given 2 hours and 15-minutes to explore the State Rooms before beginning your 1 hour and 15-minute tour in the Garden. Each tour includes a multimedia guide. If you want a guided tour of the State Rooms, but you don’t want to miss the Changing of the Guards, this combination ticket may be your best option. In addition to seeing the ceremony at 10:45 am, you will also receive a tour of 19 famous rooms inside Buckingham Palace. This combined tour is only available from July 21st – September 30th, and it is an excellent opportunity to experience some of the most notable sights at this historic location. Click here for more details or to book. This combination ticket provides entrance to The State Rooms, The Queen’s Gallery and the Royal Mews. It’s a great value if you want to make a full day out of your visit to Buckingham Palace. Your Royal Day Out will last for approximately 4 – 4 ½ hours. When purchasing your ticket, the entry time you select will be for admission to the Queen’s Gallery first. You will then be allocated an admission time for the State Rooms, which will be 2 ½ hours after you begin your visit at The Queen’s Gallery. It makes sense to visit the Royal Mews right after the Queen’s Gallery, but make sure you finish both in time to walk over to the State Rooms at the time you have been assigned. For those not visiting London in the summer months, you can still see the inside the State Rooms of Buckingham Palace during the spring on this exclusive tour offering. While it is expensive, this is the only such tour option other than the summertime tours. The tour includes a professional guide who will provide interesting details about the State Rooms. Your tour ends with a free glass of champagne and a voucher for 20% off in the gift shop. In the months that the State Rooms are open, there is so much more to do in London. Things to Do in September in London. And for year round, see our guide to Things to Do in London. As you can see, tickets to see the inside of the Palace can be quite expensive. If you’re on a budget, there are ways you can save money and still enjoy Palace buy purchasing one of several tourist attraction discount passes that include palace tours. The following discount passes provide either a discount or free admission to the Royal Mews and Queen’s Gallery. Check out our comparison post for even more details about London tourist passes. This tourist pass includes admission to both the Royal Mews and the Queen’s Gallery. If you plan on experiencing a lot of different sites in London, purchasing this all-inclusive pass could be a great way to save on tickets to at least two attractions that you’ll find at Buckingham Palace. Tourists who choose to purchase this pass will receive a free ticket for the Queen’s Gallery. This option also includes a free hop-on-hop-off bus tour and admission to the London Eye. This card gives travelers the opportunity to choose between 3, 5, 7 or 10 attractions for a discounted rate. One of the services they offer is a royal walking tour which includes a stop by Buckingham Palace, Westminster Abbey, Big Ben, and other notable sites. If you are on a budget or don’t have the time for one of the above tours, but still want a taste of Royal London, we offer a pay-what-you-like Royal Walking tour which includes Buckingham Palace, The Houses of Parliament and Big Ben. Although you won’t be able to go inside the palace, you might catch the Changing of the Guards! Prefer to explore in your own? Enjoy our free self-guided tour. We also offer a self-guided GPS-enabled audio tour!